One photo-etched fret; printed acetate instruments; instructions. Finely etched and a definite improvement on the kit parts as well as enhancing the cockpit and undercarriage. None apart from the tiny size of some parts. 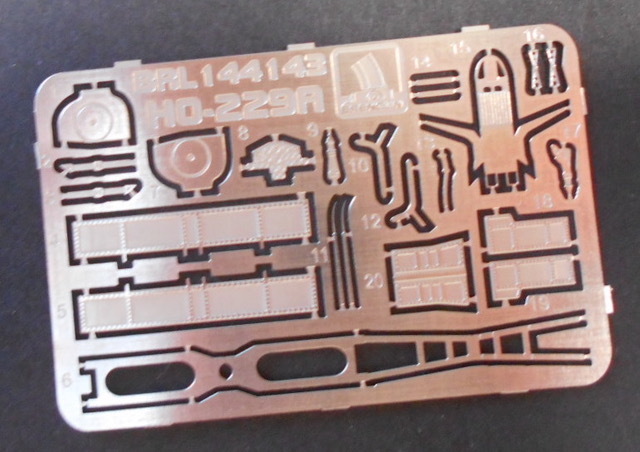 A very nice set of detailed parts to enhance what is already a well moulded little kit. I would recommend this set to the 1/144 modeller of this interesting little part of Luftwaffe history.. Designed to complement the Horton 229 kit reviewed elsewhere, this PE sheet offers a 40x30mm sheet fine detailed parts to replace or enhance the plastic kit. On the sheet are nicely detailed u/c doors, a seat, belts, instrument panel and a few controls ( the kit has just a crude seat) and undercarriage details such a whole new front leg assembly that is such a distinctive feature of this flying wing design. 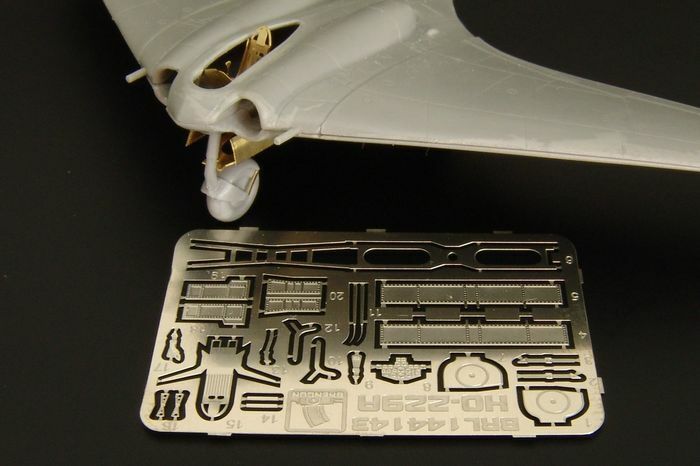 A very nice set of detailed parts to enhance what is already a well moulded little kit. I would recommend this set to the 1/144 modeller of this interesting little part of Luftwaffe history.